William Sharp began taking surfing photographs in southern California in the early seventies. and was quickly drawn into the nascent skateboard scene, shooting friends emulating surfing moves on pavement. By 1975 he was brought in as a staff photographer for the magazine Skateboard World. During the next five years he documented the meteoric rise of the movement, capturing thousands of photographs along the way. 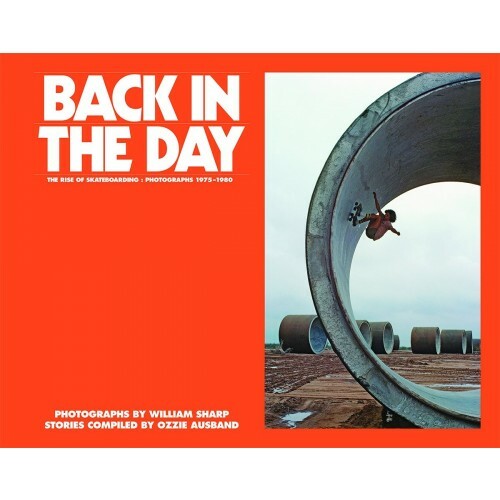 Back in the Day features hundreds of Sharp’s astounding photos from this era, the vast majority of which have never been seen before. The work is priceless, not only for its documentary value, but for the beautiful and poetic images captured and later developed by Sharp himself (many in black and white). Pipes in Arizona, aqueducts in California, pools all over the place, the locales and images must be seen to be believed. More recently, Ozzie Ausband signed on as an editor of the project, collecting present day quotes and assisting with the paring down of Sharp’s massive photo archive. Sharp’s epic photos are populated by the vanguard of the scene such as Tony Alva, Jay Adams, Jerry Valdez, Steve Caballero, and Jay Smith, among many others. Ozzie Ausband lives in Los Angeles and runs Blue Tile Obsession, a blog about pool skating and its history. William Sharp also lives in Oxnard, California and currently contributes to Surfing Magazine.